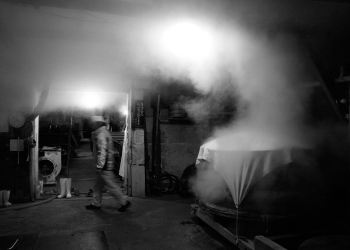 The traditional process of sake brewing involves immense time and effort. No genuine quality sake is produced without a great passion and pursuit of perfection at every step from choosing the right ingredients, to polishing the rice, making the koji mold, shikomi preparation, and pressing. One determining factor of a sake's quality is the amount of pressure applied when straining out liquids. Shibori, the straining process, involves the dividing of moromi into sake and sake cake. In this process, squeezing with as little pressure as possible is the key to producing a good sake. However, in recent times most sake breweries use an automated pressing machine to accomplish shibori, a method known as 'Yabuta style'. This contemporary method allows time and cost reduction, but on the other hand, pressing these larger batches of moromi together at once can undermine the taste and flavor of sake. Thus, we have remained faithful to the traditional 'Sase style' shibori method over the entire history of our brewery. This style is carried out by carefully hand-stuffing moromi into cloth bags, stacking them, and slowly pressing from the top to extract the sake. As this method only produces a small amount of sake with a single pressing, the process is often repeated in subsequent pressings to extract all the sake that can be used for the final products. Of course, this process requires tremendous time and effort, and currently only 10% of sake breweries in Tochigi Prefecture still apply this process. However, we are committed to upholding this tradition as part of our goal to promote and preserve the pure and genuine sake flavor which is carefully crafted by human hands. This fuels our persistent devotion to the traditional style of brewing sake. No quality sake can be made without access to quality water. In the area of the Takino Shrine, an auxiliary shrine of the famous Nikko Futarasan Shrine, there is a spring called 'Sake no Izumi' (lit. Spring of Sake). This is one of the Three Spiritual Waters of Nikko, and is also known through a legend of Kobo Daishi, an influential Heian period monk. 'Senryo-sui', the name of the Daiya River's undercurrent water in the Nikko Mountain Range, is sourced from the 'Sake no Izumi' spring and has been our water supply for sake production since the brewery's founding in 1880. Our original founder left Niigata Prefecture's Kashiwazaki City on a journey to seek out the best water source for sake, which he eventually found here in Imaichi, Nikko City. 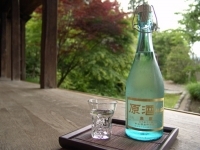 'Senryo-sui' water is soft water drawn from 16 meters underground, and it is perfect for sake with a smooth taste and aroma. In addition to water, we are also very careful with selections of other key ingredients such as rice and yeast. We use Yamada-nishiki special A-grade rice from Hyogo Prefecture, and a special unique yeast developed in Tochigi Prefecture. We believe quality ingredients are at the core of quality sake. Faithful to our ancestors, we keep this tradition and never compromise ingredients for cost or convenience. We want you to experience the true original taste of sake. This is why we consistently value direct sales. Our featured product line, Kashiwazakari, is undiluted genshu sake with no water added after extraction. This brand has been loved by jizake (local sake) fans throughout its 30 years of production. Within the Kashiwazakari genshu lineup, Sugao is widely praised as a pure nama-genshu (unpasteurized and undiluted sake) produced by collecting the drips of sake that naturally flow out before pressing. We bottle this rare portion without filtering or heat treatment. If we relied on a regular distribution channel, it could take a month before the product reached retail shelves. On the other hand, at our own store we can provide customers with the freshest quality, saving both time and cost. Selling from a distribution chain would be more profitable, but would also risk the integrity and flavor of our pure sake by the time it reached our customers. In old times, the tax rate for alcohol was calculated in correlation to alcohol percentage. While many other sake breweries gave up on genshu production since it contains a higher concentration of alcohol, we persistently continued production without concern of profits. While alcohol tax was eventually revised, resulting in the same tax rates for both genshu and regular sake, many breweries had already lost the techniques and know-how for making genshu. Hence we hold a strong sense of responsibility to continue our tradition of genshu. We are driven to provide customers with quality sake that reflects both our traditional processes and the natural spring water of Nikko. The passion of reaching this goal fuels the steadfast commitment to our time-honored tradition. Sake-making involves a series of processes, and changes or variations to these processes can greatly affect things like flavor and body of the final sake product. Here, we'll introduce the most important process to determine the quality of sake, called sandan-shikomi. We'll also give an overview of our process for making nama-genshu (unpasteurized and undiluted sake), which embodies the freshness of coming straight from our brewery. Sandan-shikomi, or three-step preparation, is the unique sake-making procedure for producing the fermentation mash. This process encourages the growth of yeast and suppresses bacterial growth, and also facilitates the optimal temperature required for the moromi, or fermentation mash. It requires four days to complete this process. On day one, the first addition process, or hatsu-zoe, takes place where moto (starter culture), steamed rice, koji mold, and water are all added and mixed together. The day after hatsu-zoe is called odori, a resting period for the mixture. This important step determines the extent of yeast activation and greatly affects the quality of sake. 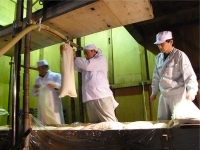 Then on the third day, the second addition process, naka-zoe, is conducted by adding more steamed rice, koji mold, and water, collectively adding about 20-40% of the hatsu-zoe amount. 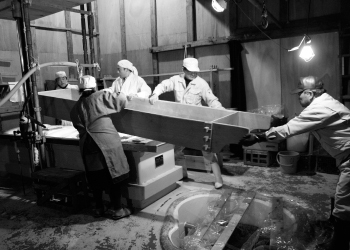 Lastly on the fourth day, the third addition process, or tome-zoe, takes place to complete the whole shikomi process. 2. What is 'Sase style' pressing? 'Sase style' is a pressing method using the traditional Sase pressor. We carefully hand-pack moromi into bags, then stack the bags vertically, and the pressor machine slowly presses from the top to extract sake. In order to avoid off-note flavors, we first wait for sake to drip out just by the force of the moromi bags' own weight, and then we very gradually and slowly add pressure with the machine. Because only one cycle of this process will not extract all the usable sake, we repeat this for multiple times to extract the total amount over the course of three to four days. Because this process requires so much time and effort, less than 10% of the breweries in Tochigi Prefecture still use the method today. We have been carefully producing quality sake with the same Sase pressor since the foundation of our brewery in 1880. Nama-genshu is unfiltered, unpasteurized, and undiluted sake, embodying the flavor of pure sake coming straight from the moromi mash. Freshly brewed sake is normally stored, then filtered and pasteurized to prevent deterioration. Nama-genshu on the other hand is pure and unprocessed, so its shelf-life makes it difficult to sell through regular channels. It used to be a treat only for the sake brewery workers, or kurabito. Nama-genshu is recommended to be stored at low temperatures to preserve its original flavor. However, the continuous maturing flavor after opening the bottle is also something you can enjoy. Visit us for a brewery tour and learn even more about sake-making! In our brewery tour, you can see our mash-pressing process with the Sase style pressor passed down from our ancestors and used since our founding in 1880. This offers a rare chance to see this special process because only about 10% of breweries in Tochigi now use this machine. If your tour coincides with our actual pressing process, you'll be able to try our freshly extracted sake on-site. After the tour, you'll also have a chance to buy our sake products at our adjacent shop. Tours are available free of charge. Please contact us to reserve tours in advance. 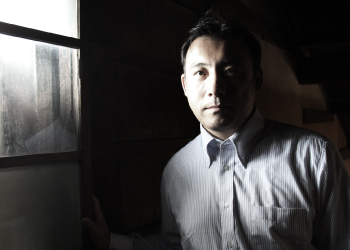 The sixth head of Katayama Shuzo remains strongly committed to his family's tradition. Since its inception,Katayama Shuzo has been dedicated to the Sase style. Copyright © 2016 Katayama Shuzo All Rights Reserved.